Why doesn’t Myki online topup happen instantly? Update: Since 2016, Myki top-ups have been sped-up, and are now done within about 90 minutes. 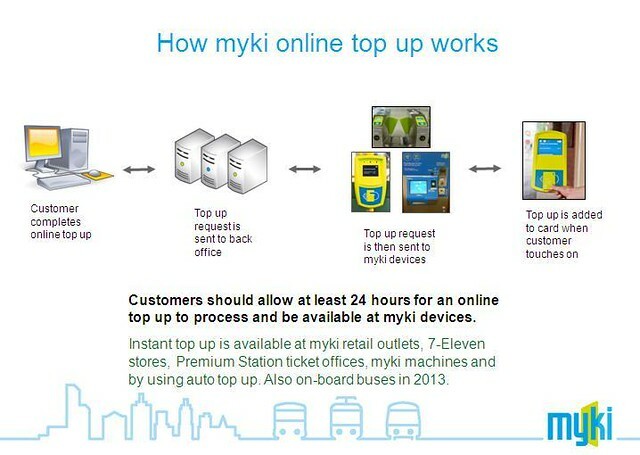 Why does Myki online topup take 24 hours or more? Why isn’t it instant like other services? It doesn’t necessarily take that long. They say that to cover themselves. I’ve seen it work within an hour or two. It takes a little while because unlike, say, mobile phone prepaid accounts or bank accounts or Citylink transponder accounts, the balance is maintained on the card itself. 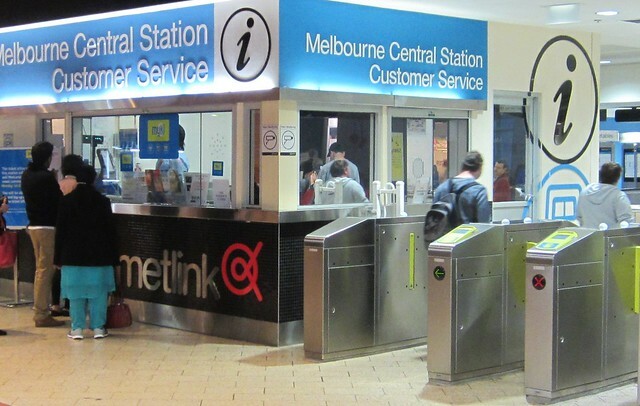 When you top-up online, the transaction gets sent from the central computers (eg the web site) to every Myki reader and machine in the state (which may take some time, especially for tram and bus readers) to await the presence of your card. Once your card is presented (as long as it’s within 90 days), the new balance is updated onto the card, and you’re set to go. Note any top-up where the card is present on the system (eg vending machine or retailer) is instant. As far as I know, all public transport smartcard systems work like this — the balance is always held on the card, for (theoretically) fast and reliable response times when touching on/off, especially for mobile readers eg on trams and buses. It should be consistently faster, but it’ll never be instant. Don’t forget I’ve got a pristine Metcard on sale for charity! Bidding finishes this Thursday. PS. As Dave says in the comments, Auto Topup works differently to the above, and is instant once it’s set up and running (because after that each transaction is initiated from the card and reader). Next → Next post: Tracking Southland station: any progress since the 2010 election? There’s the caveat that auto-topup is instant – after it’s done the first debit, it assumes your debit arrangements are always valid and extends you any topups you need ‘automagically’. I now only use 7-elevens to top up my Myki. I never have a problem and when I touch on (a few minutes later) the credit is already there. The payment machines at the station display contradictory instructions and topping up online can take days to register on the card. Surprisingly I actually appreciate the 24 hours scenario top up not showing, but there is little else. For example why when I log into my account on their web site. It knows the exact time of my last transaction was yesterday but the website transactions list only shows my Friday transactions? I find myself resenting MYKI more and more as it seems so machine orientated and yet so incomprehensible to me. Except for the case where you card is in negative, then you can add as many days as you want and it still won’t let you use the %^*! card unless you put put money onto it. Myki money is the biggest ripoff going, I swear I ended up spending $150 on the first month I used it. It lies and charges you odd amounts due to not touching off on the tram and then using the train making an unbalanced match. I’m waiting for a generic purse system, do we really want one card per system? Ideally, it’d be part of your credit-card as well. I’m a computer programmer and technophile, but I don’t like to see stupid technology introduced for no good reason. The metcard and myki ticket systems are inefficient, idiotic. Australia has spent a huge amount of money creating and sustaining these ticket systems: the machines, the barriers, the ticket police, the IT infrastructure … just to make sure that everyone pays the right amount of money. The barriers are annoying and can be dangerous especially to children and pregnant women. The whole system is vastly less efficient than it could be without all this technology and bean counting. The old system with tram conductors and paper tickets was much more efficient and all-round better. I think the best solution would be to get rid of the tickets and payment entirely. Public transport is better for the environment and it makes sense to encourage users. It can be funded by taxation. We can have friendly and helpful conductors again, instead of detestable borg ticket police. This would be vastly more efficient than the current system.